Although ice breaker games are usually carried out before a meeting or to motivate a small group of staff before a team building event, you may need to incorporate a game into a large conference or to encourage large numbers of employees. In cases such as these you will need to think carefully about what style and game type you intend to use. Ice breaker games for large groups can take lots of organising and, due to the group size, often become time consuming. 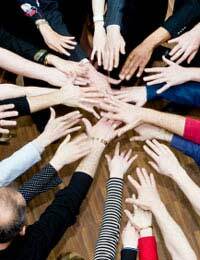 Breaking down barriers in a large group can be far more complex than that of a smaller group. The ice breaker you use should get everyone motivated and feeling comfortable in their surroundings quickly and simply. Business techniques, as we all know, become successful through trial and error and in the case of ice breaker games this is just as true. This article offers some tried and tested ice breaker games specifically designed to work effectively with large groups. This game is a simple game that gets the group involved. Before the event, gather between 5 and 10 random items. These items can be anything. You could use office items or items relevant to the event. For instance if the event is a product launch you could gather the product itself and possibly similar designs. Then, once the group have settled produce the container of items and explain that you are going to show them a selection of items one at a time and that you want people to call out an alternative use for what you are holding in front of them. If the item is the product you are launching ask people to call out their opinion on why it is better (or worse) than other designs. This game can produce some fun answers and also relaxes the group. It can also be played with any size group. This ice breaker adds a little competition to the event and is perfect for large groups. A simple way of breaking barriers within a large group is to break the group into smaller groups and applying the same task to all groups. This insures that everyone is involved and that they all have a central conversation point. Once the group have arrived split the group into small teams, 3 or 4 is usually a good amount. Hand out something that requires them to work as a team and build. Two popular building props are a pack of cards or a small amount of Lego. Explain to the group that they have 5 minutes to build a house out of the cards provided or, if using Lego blocks, the most imaginative creation. You then start the stop watch and whichever team builds something the quickest wins. This game is a lot of fun and strengthens the workforce. This game is extremely simple and can include a large number of participants. Once everybody has arrived instruct the group to come up with three words that describe them e.g. ‘My name is Philip and I am loud, adventurous and unpredictable’. This is a simple game that can make its way around a large group quickly. It also encourages participants to learn a little about each other. Insure your ice breaker game does not become too time-consuming as this will cause the group to lose interest. You also want to make sure that everybody is involved and enjoying themselves. Take these ideas and create something you feel will be appropriate for your event or situation. This is a tricky one. You want everyone involved, but in all probability there will be a few shy ones who’d rather keep in the background. Encourage them, but be careful not to push them too much. At the same time, be sure everyone gets involved, not only the loud, gregarious types.